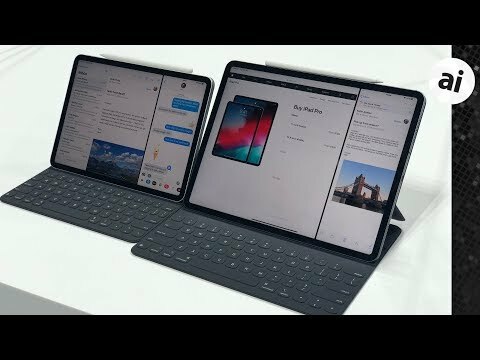 The iPad Pro is now available in an 11-inch model with the same footprint as the 10.5-inch but with a bigger display, and a 12.9-inch model with a reduced physical size versus the first- and second-generation units. A new design includes including squared off edges similar to that of the iPhone 4, a relocated Smart Connector, and a beautiful new display. The display was absolutely stunning to us as we handled it, going close to the edges without feeling like the bezel was too small. Within the bezel, Apple hides the True Depth camera system which is used for taking Portrait mode selfies, using Animoji/Memoji, and of course Face ID. Face ID is implemented well, working at any angle as we rotated the iPad. There is even a nice touch where if you cover the camera on accident and try to unlock the iPad, it alerts you that the camera is being covered. That means the Home button is gone, and frankly, we won't miss it. Other improvements to the display include tap to wake -- like on the iPhone -- and rounded corners to match the curvature of the aluminum body. In other big news, the Lightning port has been replaced by USB-Cm which we are sure going to appreciate. It adds a lot of new functionality, much of which Apple was showing off in the hands-on area. You can connect it to a 5K display, connect it directly to your USB-C camera, and even power your iPhone/Apple Watch from it. On the 11-inch model, we love that we get a bit of extra screen real estate compared to the 10.5-inch that had the same physical dimensions. It is a nice touch and reminds us of the display on the XR compared to the iPhone 8 Plus. Apple has seemingly fixed all the complaints that user had regarding the original Apple Pencil in the second generation of the product now that it has a seamless body, no cap, and charges wirelessly. There is gesture support that works in Apple's Notes app and can be customized in others. In Notes, double tapping the side switches between your drawing instrument and the eraser. The only downside is that the original Pencil won't work with the new iPads and the new Pencil won't work with the old iPads. But, we liked the new Pencil so much it is probably worth it to upgrade anyway. The new Apple Pencil is available for $129, an increase from the original $99 price tag. The Smart Keyboard got improvements beyond just the new size. It now has a full-sized keyboard and for the first time protects the back of the iPad as well as the front. It cleverly attaches via magnets and takes some effort to remove so it won't get dislodged by accident. It also still supports two different typing angles to adjust for different work environments. The 11-inch Smart Keyboard retails at $179 while the larger 12.9-inch model comes in at $199. All of Apple's new tablets are able to be ordered now. The 12.9-inch model starts at $999 and the 11-inch model comes in at $799. For the latest product availability and deals across multiple Apple resellers, be sure to check out our 11-inch iPad Pro and 12.9-inch iPad Pro Price Guides. Still waiting for a new iPad Mini! Current one has an A8 with 1GB RAM! Come on Apple, you need to just swap out the SoC and RAM chip cluster! Take nothing, no R&D, no new components! You can even uses small sticks the have a 5 and place then over the 4 box. Cost is very minimal! You have a brand new product! I wish the video had shown more of the keyboard. I ordered my 12.9" as soon as it was available (moving up from the 10.5") and I'm a little concerned the keyboard/folio (which I also ordered) will take up a lot of volume and add additional weight. Daniel if you have any thoughts on that I would be interested in hearing them. I'm hoping a further software update will allow the iPad Pro to act as a true second screen for a MBP - my only disappointment of the day that isn't available yet. Otherwise a very classy and interesting presentation by Apple that seemed to hit everyone's "wish lists"
Looks like Apple haven’t changed the slick & hard Pencil tip. Wouldn’t you just not cover the camera with your fingers? They didn't fix all the complaints with the Apple Pencil. The slippery tip! MAJOR complaint completely ignored. They have known about the tip issue for 3 years! Their solution is for you to buy a screen protector to get a more resistant feel. No third party tips that offer more resistance. Someone else informed me what the device does (it tells you you’re covering it). I still expect this to not be ideal, but I’m hoping to see people’s commentary about it later when they start using these devices. But to respond to you, I have to ask you if you’re able to easily tell when you’re coving the multiple sensors, when they’re almost invisible to the eye? The camera alone isn’t enough, and that’s hard to see, too. Thank you for that info, I missed it in the article and hadn’t watched the video. Pity the keyboard doesn’t have a trackpad. I just think that would be handy in “laptop” configuration. So if I buy a new iPad Pro and want to watch a video or listen to music while travelling do I now also have to buy AirPods ? So another £159 on top. Have I missed something glaringly obvious ? Yes. You could use the standard EarPods that come with your iPhone, any number of competitor Bluetooth In ear, on ear or over ear devices, or you could buy a $9 dongle with a built in DAC permanently attached to your old school earphones.. Thanks Entropys. It's just I didn't notice any connectors for attaching standard apple supplied iPhone headphones - is there a lightning connector on there also ? I also couldn't see a USB-C to lightning adapter on the Apple site either. ...so your claim that one must 159 is bunk. I haven't been able to find a lightning to thunderbolt adapter. Maybe you could just suggest one. But that adapter doesn’t permit charging/powering through that port, right? It’s just Lightning to headphone connector? Very cool. Now wishing I hadn't gotten an iPad pro & pencil last year. I'm always afraid I'm going to snap the thing off when I plug it into the iPad to charge it. They didn't fix the shortcomings of the keyboard though. The Logitech one I got has better keys, a row of function keys, a backlight, and a loop to hold the pencil. Hopefully they come out with a similar version for the new iPad pro. No. I don't know if a combined USB C - USB C + 3.5mm dongle exists like it does for the lightning port or not. For the iPad, the battery is such that charging isn't nearly the issue it is on a cell phone. Conversely, none of Apple's stated reasons for getting rid of the headphone jack on the iPhone apply to the iPad, so there is really no reason Apple couldn't have put a 3.5mm jack on the iPad, either, other than to force people away from the industry standard 3.5mm jack.